As previously mentioned, I have begun a little project of catching up on recent (defined as ‘since I last really paid attention’) work in Victorian studies. In aid of this, I have browsed the TOC from a couple of the major academic journals in the field and downloaded a bunch of essays and book reviews (so far, about 75), which I am reading through to get a feel for what people have been doing, what I should know more about, books I should look up for further reading, and so on. I decided to go back about 5 years: it’s not as if I haven’t looked at any criticism published since 2006, but much of my searching has been quite targetted, whereas now I am just looking, not looking for anything in particular. It’s not a particularly inspiring task. I’ve looked at probably 30 or 40 files so far, and not one of them has given me any sense of urgency–nothing, so far, has made me think that I need to reconsider what I usually do in the classroom, for instance. But I’ve listed a few books already that I’d like to take a look, or another look, at, and I’ve filed some essays away where they will be accessible for more specialized work–research or graduate teaching. I have discovered that my iPad is really a wonderful tool for this kind of work. I’ve got the PDFs all tucked into the GoodReader app, which lets me easily highlight and annotate them, and then as I finish looking at each one I tap it away into the appropriate folder so I can find it again when I want to. Yes, I can do these things on my desktop with Adobe Pro, but how much more comfortable to do this in a more accomodating posture than sitting bolt upright staring straight ahead! And my right wrist is grateful to have a break from mousing around. I’ve still got the files saved into folders on the desktop if I want them, but I’m loving this system. It makes me think I might even get into a habit of reviewing recent criticism! Imagine. 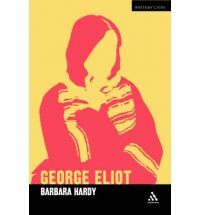 It’s a review by George Levine of Barbara Hardy’s George Eliot: A Critic’s Biography, a book I have but have not sat down and read attentively, though I have long been an admirer of Hardy, as is probably anyone who has studied George Eliot. As I filed the review away in my ‘George Eliot’ folder, I had a dim flash of recollection: didn’t I write something about Barbara Hardy as my critical model right here on Novel Readings at some point? Sure enough, I did. Here’s the old post, in its entirety. Please note that I wrote it almost three years ago to the day. I’ve put it at the top of my “t0 read” pile. Here’s a new resolution. I will not only read the book but I will write about it here when I have done so. And not any three years from now, either. Repetition is an essential and effective rhetorical device.